In 2012 fashion fanatic and colour devotee Carolina Palaez started a business specialising in fashion nail polish and nail accessories. Her dream was to create products so incredibly desirable and unique that you’d always want at least two. 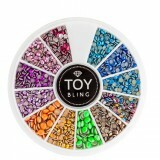 The brand name soon evolved into TOY, the acronym of Two of You, and Palaez began championing #TOYStyle with an ever increasing selection of innovative nail products. Viewing TOY polishes more as accessories than beauty products, Palaez took to social media with great gusto – sharing her bright, dynamic life with followers on Instagram, Facebook and Pinterest. She began uploading tips, ideas, news and trends daily and encouraged her TOY community to have fun with her TOY creations. Today Palaez shares her #TOYDream with over 15 000 people across the globe. Beautysouthafrica.com is South Africa’s most comprehensive online beauty magazine and your pre-shop stop for product information and reviews. From the latest international make-up trends to the hottest new products on the market, we offer insights into the glamorous world of beauty. Join like-minded beauty fanatics in our loyalty program and earn points, trial beauty products and share your experiences. Win SOTHYS skincare worth R1910! Thinking of getting a vampire facial? Why join our Beauty Network? © 2019 BeautySouthAfrica. All rights reserved. Get great deals and climb the ladder to a Gold Star!